Over the last month or so, everything has been turning up roses for the No. 3 Boston University men’s hockey team. The Terriers are riding a six-game winning streak, seven players recently secured a silver or gold medal at the 2017 World Junior Championships, freshman goaltender Jake Oettinger boasts a .956 save percentage in his last three tilts and sophomore forward Jakob Forsbacka Karlsson is a man on fire in front of the goal. However, the message inside Agganis Arena goes something like this: don’t let any of that get to your head. As mentioned, BU’s (14-5-2, 7-2-2 Hockey East) order of business this weekend comes against a team that’s struggling somewhat to kick into gear. One needs to look no further than where the Black Bears (8-11-3, 2-7-1 Hockey East) sit in the conference standings to deduce that, as they’re tied for last place. That doesn’t mean the Terriers are going to take them lightly, though. Especially not with Red Gendron, Maine’s third-year head coach leading the charge. Arguably the stiffest battles will come against forwards Cam Brown (26 points) and Blaine Byron (23 points), both of whom rest inside Hockey East’s top 15 scorers. Meanwhile, Maine’s likely starting netminder, sophomore Rob McGovern, was named the Hockey East Defensive Player of the Week on Monday. He boasts a 2.80 goals against average and .914 save percentage for the year. 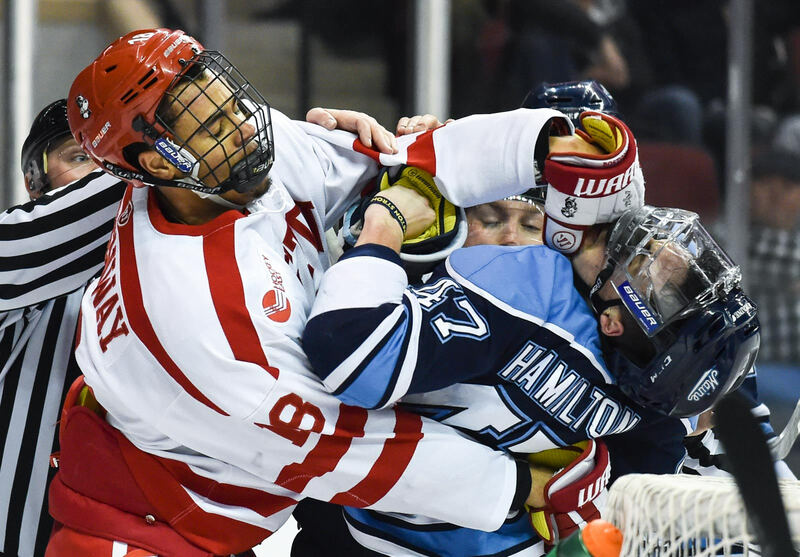 Given those threats, Brandon Hickey, a junior defenseman for the Terriers, said he holds a healthy respect for the Black Bears. It’s notable that Hickey references BC (14-9-2, 9-3-1 Hockey East) largely because BU is coming off its first weekend sweep of its archrival since the 2001-02 season. It outscored head coach Jerry York’s side 5-1 during the weekend series, climbing up to second place in the conference standings along the way. That run of form left Carpenter surging with confidence. Now, as Carpenter suggested, the challenge before BU is continuing this red-hot start to 2017. 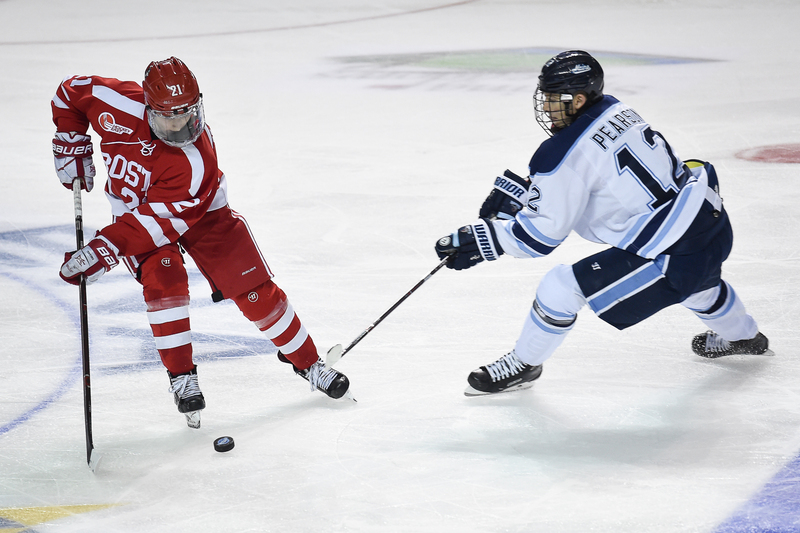 Maine, a team that’s 3-2 in its last five contests, stands in the way of those hopes. However, Quinn feels that if the Terriers play with purpose and speed, the points should continue to pile up. “We’ve been talking about it as a group; we’re not preparing to play an opponent, we’re preparing to play to the best of our ability,” Quinn said. “That’s all it’s about. It’s just about every day coming here and trying to be the best player you can be and be the best team we can be.